The bedroom is a place where you want the flooring to be soft, plush, and comfortable underfoot. Unfortunately, many of the flooring materials that meet those criteria are actually susceptible to damage from simple, normal pet habits. The following are a series of bedroom flooring dos and don’ts for pet owners, as well as a look at some of the best material choices you can make. For Pets: Made from mountains, stone is one of the strongest solid flooring materials available. In its natural and gauged surface state, it’s immune to scratches from pet claws. However high polished materials such as marble may be prone to scratching over time. 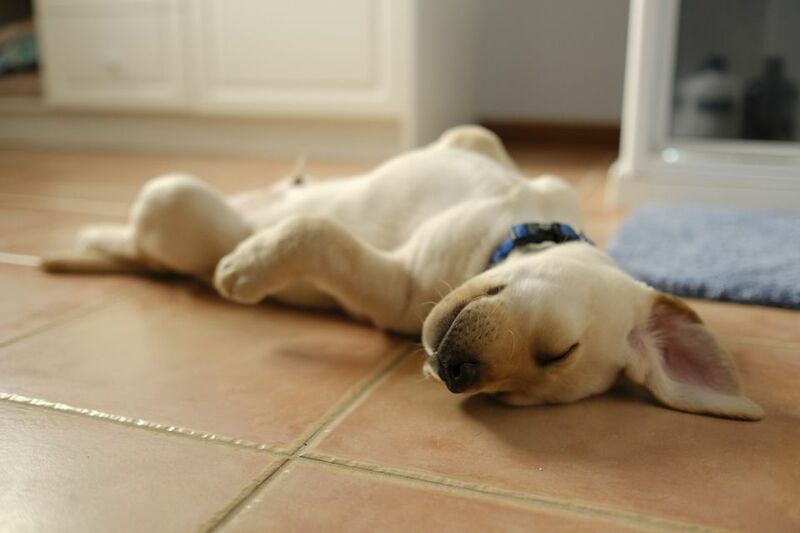 For pet owners, the best bedroom flooring choice is going to be slate, travertine, or granite. For Bedrooms: Because they are natural, stone floors can feel a little bit more welcoming and personal than manufactured tiles, which is important in a bedroom. The material itself can get cold on chilly mornings, but this can be offset by using strategically placed throw rugs. Stone is also a great conductor for below surface radiant heating systems. For Pets: Vinyl is extremely durable, stain resistant, scratch resistant, and germ resistant. A manufactured material, it is similar to having a plastic coating for your floor. This means that it is very easy to clean up any pet messes that may occur, and they won’t leave behind residues or stains. For Bedrooms: Vinyl isn’t terribly common in bedrooms but it is gaining in popularity. This is due to the fact that it is relatively inexpensive while also being available in a wide variety of colors, patterns, and natural look options. However, there are some ecological concerns about vinyl as a flooring material. For Pets: Laminate flooring has an invisible wear layer which rests on the top of the decorative layer. This wear layer is extremely durable, and while it will wear down eventually over time, when it is in place it is a nearly impervious shield against scratches and pet accident stains. For Bedrooms: Laminate flooring can be manufactured to look like a wide variety of exotic natural materials while costing only a fraction of their real counterparts. This allows you to achieve a sophisticated hardwood or natural stone look in your bedroom, without any of the drawbacks of pet damage or maintenance. For Pets: Ceramic flooring is virtually hassle-free when it comes to pets. With glazed tile you have a hard surface that won’t scratch, break, or stain no matter what they do. It’s also really easy to clean up any messes that may happen and completely sanitize the area. The only problem you might have is with an over-exuberant puppy losing traction as he races across the bedroom, sending them skidding towards the wall. For Bedrooms: Ceramic can be printed and cut to look like almost anything, including a wide variety of natural materials, allowing you to match nearly any look you want in your bedroom. While the tile itself is fairly hard and can get cold, ceramics are a great medium for below surface radiant heat systems. Cork: The surface seal that is applied to cork after installation will make it proof against stains from pet accidents ​if they are cleaned up quickly. The problem is that cork is very soft, and the nails of dogs, especially large, heavy dogs, can scratch the surface of this flooring up over time. Cat’s can also get into a scratching frenzy with a cork bedroom floor and do some damage. Carpet: Carpeting can be notoriously difficult to get clean after pet accidents. That is especially true if there is time for the stain and stench to really set in. Certain types of carpet can also cause cats to tear and scratch at the threads. Hardwood and Bamboo: These two materials are very similar and they aren’t necessarily the worst choice for a pet owners bedroom. However, over time pet nails from larger dogs can scratch the surface of some wood floors. You can also have problems with staining and germ growth if accidents aren’t cleaned up quickly. Placing floor mats at the entrance to the bedroom can help to cut down on any dirt that a dog might track into the room. If there is a litter box nearby it should also be placed on a floor mat in order to try and catch litter particles from the cat’s paws as they leave the area. Never allow pets to eat in the bedroom area. Instead, get them used to eating in a set place outside of the bedroom. A scratching post can also be used to divert a cats clawing instincts away from carpeting.